Won’t You Take Me To… Forkytown? i stumbled on this with my special lady friend, who told me that it might be some kind of pirate revenge. that would explain the tiny pirate flags on some of the forks in the back section of this mysterious fork garden. (for those of you who don’t know, portland has a large pirate population.) 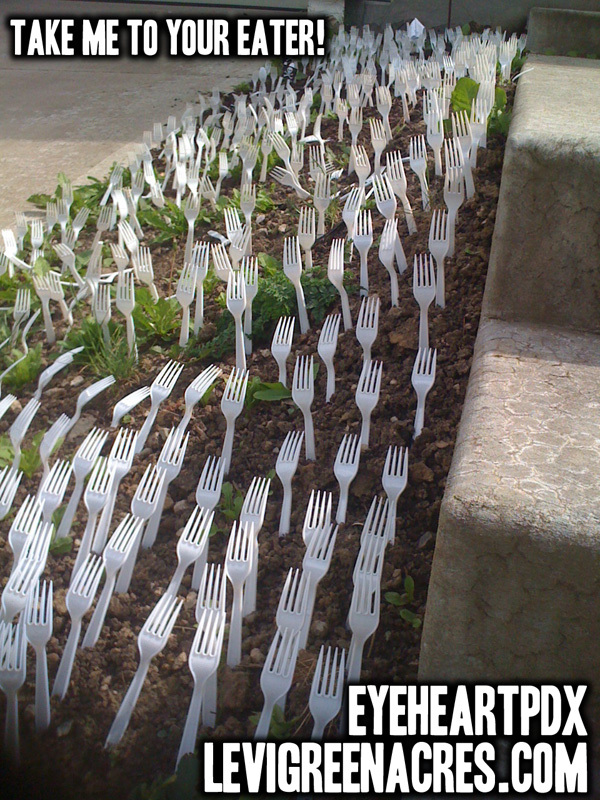 on one of the pointy white implants is a note that read: “THIS IS FOR YOUR PUPPY.” whether the planter of this field of forks was gifting a talented dog with cheap cutlery, or performing an unusual retribution on account of something the puppy in question had done is an enigma. does anyone know anything about this practice of forking, or about these forks in particular?